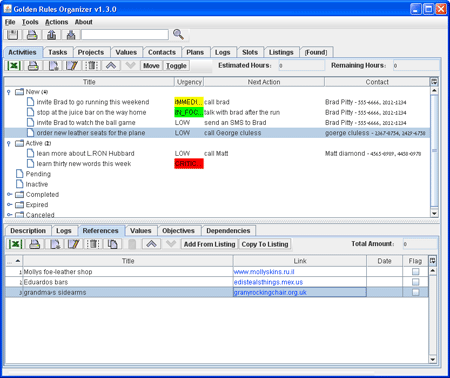 Golden Rules Organizer is a Free and Portable Personal Information Manager created by Michael Gvirtzman. It is a Personal organizer you can use to manage your daily or weekly tasks, projects, activities, contacts, schedules, plans and more. It could also be used as a personal diary or to simply keep notes in an ordered structure. Authors Website: It appears the author has abandoned this project. Note: Golden Rules Organizer does require Java Runtime Environment to run, but a user can copy the JRE directory from a PC to the USB device (renaming jre6 for example to jre) bypassing the need to have Java installed on the PC.